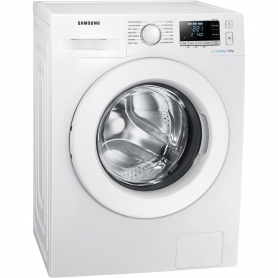 Exclusive to Euronics and Agent stores, this freestanding Samsung washing machine is available in a white gloss finish to suit any home. The WW70J5556MW could even save you money to run, holding an A+++ grade for energy efficiency. With a range of features for better cleaning and a drum capacity of up to 7 kg, let this model take the stress out of doing the laundry. The WW70J5556MW features Samsung’s ‘Digital Inverter Motor’ to reduce wear and tear. This brushless motor is driven with magnets for less friction, less noise and less vibration. The WW70J5556MW also features an ‘Eco Drum Clean’ programme, which keeps the drum, glass door and diaphragm clean. Using hot water and a high-speed spin cycle, this eco-friendly wash keeps your machine and laundry as hygienic as possible. Why not connect your smartphone to the WW70J5556MW, and try the ‘Smart Check’ feature? This software provides easy troubleshooting for your washing machine, scanning for errors via a dedicated app. With quick feedback, you can solve problems before they get out of hand, and even save the cost of an engineer callout. Looking for a larger capacity? 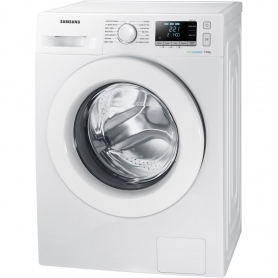 This Samsung washing machine is also available with an 8 kg capacity - WW80J5556MW. 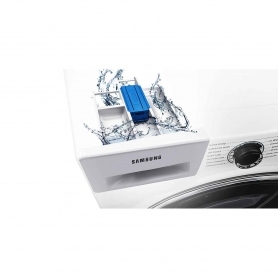 Bubble cleaning technology offers gentle cleaning for each 7 kg load with the Samsung WW70J5556M. Buy yours today.